We believe that it takes a village to raise a child. That’s why we are eager to be active partners in your child’s journey of wonder and self-discovery. We value your trust and work hard to earn it, with tried and true methods stemming from over 50 years of experience. Hear from other parents like you! Should we send our kids for 1 week or 2 weeks? 11 million children and parents can’t be wrong! Children who attend summer camps often show an increase in self-confidence and independence. They learn positive values from role models and gain leadership and communication skills outside of the school and home setting. Children have a chance to develop as individuals and are given the freedom to be themselves. What questions should I ask when choosing a camp? As a parent, you might already have come to the realization that picking the right summer camp for your child isn’t easy. It’s an important and time-consuming decision. We’ve shared our 6 best tips in a blog! Camp Friendship is accredited by the American Camp Association (ACA) and has proudly held this accreditation for many years. Yes. Camp Friendship aims to provide a quality, memorable camp experience in a safe and supportive environment. An ACA accredited camp since our start over 50 years ago, we take pride in exceeding safety standards in the camping industry. Additionally, our Camp Owners and Directors live on-site throughout the year and take every possible measure to ensure the safety of campers and staff each summer. We never settle and always strive to create the best environment for each and every child. 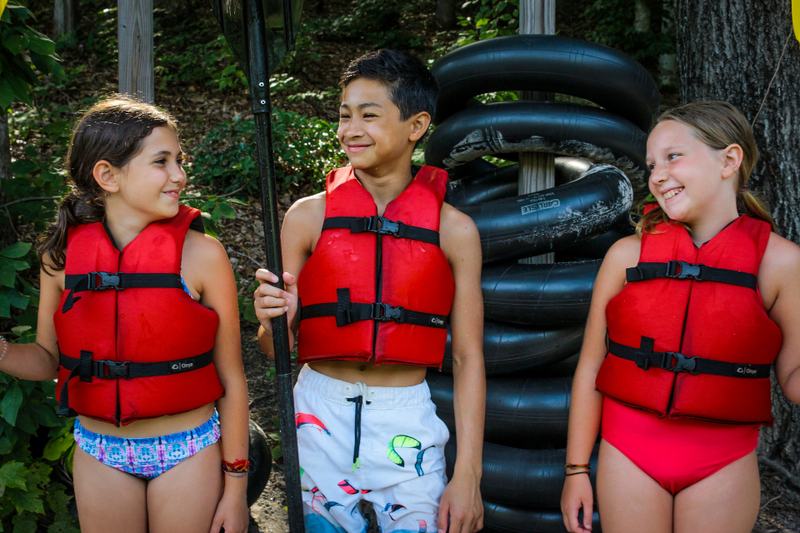 Being an ACA-accredited camp means that we voluntarily adhere to over 300 strict industry standards in an effort to keep our campers and staff members safe, healthy and happy every summer. All ACA-accredited camps undergo an annual review of their policies and are visited by trained camp professionals to ensure ACA standards are met and practiced. Camp Friendship provides quality health care 24/7 from our fully-equipped Health Center that is centrally located on camp for quick access. Certified and experienced health personnel are selected by Camp Directors each summer and reside on camp property. A physician is also on call and the local Rescue Squad is only 1 mile away. Should a child need further attention, two hospitals are just thirty miles away in Charlottesville. How does Camp Friendship select staff? Camp Friendship’s family of staff are chosen because they are caring, skilled, experienced and fun to be around! Our Camp Directors search for the very best counselors, program staff and support staff to meet our needs. Each staff member is intentionally and carefully selected on an individual basis and, above all else, must meet our founding principles of kindness and acceptance. Absolutely all candidates go through a thorough screening process including a criminal background check in compliance with ACA standards. Camp Friendship offers up to 3 weeks of in-person training before campers arrive. All staff undergo a minimum of 1 week of training each season, even though many of our counselors return to camp year after year. Counselors are trained by experienced Camp Directors, who set the expectation that our campers come first every time. Counselors are trained in all aspects of camper safety and well-being and are taught how to encourage a growth mindset. If not already certified, counselors become Lifeguard, First Aid/CPR/AED certified at camp through the American Red Cross. Our Senior Counselors and Village Supervisors are college students and graduates with previous experience working with children in camps, schools and daycare programs. Our Program Supervisors hold specific skills, qualifications and experience in the program area they supervise and are responsible for training counselors in that program area with direct oversight from our Camp Directors. Our Junior Counselors are generally former campers who have experience in child care or babysitting and have completed our Counselor-in-Training program here at Camp Friendship. The majority of our staff are trained lifeguards, or at the very least hold First Aid/CPR/AED certifications. Our Health Center Team includes a Registered Nurse and medical-trainee Health Center assistants who hold First Aid/CPR/AED certifications. We have over 35 different activities to choose from, so there’s something for everyone! Unlike many other camps, we allow our campers to choose their own activities each week, encouraging kids to explore new interests and gain a sense of independence in a safe and supportive environment. What does a typical ‘camp day’ look like? Check out the programs pages for sample daily schedules! What activities are available at Camp Friendship? Camp Friendship offers over 35 different activities in the hopes of having something to suit every interest! Please see our activities page for available activities. How do campers select their activities? When campers arrive at camp on a Sunday, they select their top 10 activities from a list of over 35 options. On Monday morning, campers receive a personalized schedule for the week with 5 activities listed – 3 in the morning and 2 in the afternoon. We aim for every camper’s individual schedule to reflect at least 2 of their top 5 activity choices, but this standard is usually surpassed with campers receiving an average of 3 of their top 5 choices. In all of our activities and interactions, Camp Friendship focuses on supporting and encouraging each child’s development. A child centered philosophy is combined with high-caliber programming to make summer camp an experience like no other. That’s okay – we will keep your child safe. All campers undergo a swim check when they get to camp to determine their comfort level in the water. However, if your child is truly a non-swimmer, they do not need to do a swim check and can be logged as such. This is standard procedure at most camps and is done purely for the safety of your child. Swim checks are done by cabin and will always be supervised by qualified lifeguards and an appropriate program supervisor. Campers are discreetly assigned a colored Buddy Tag that will allow lifeguards to determine whether they need to wear a life jacket/PFD when swimming. Campers are never discriminated against, no matter their capabilities, and every effort is made to encourage all swimmers to use flotation aids/toys to ensure their safety. What do campers do on the weekends? Stayover Saturdays are a great addition to the camp experience as they offer some much needed down time for campers to prepare for another week full of fun. Campers staying for the following session will have the chance to try out new activities during stayover and will enjoy extra time in the pool with their friends. Campers get to sleep in on Sunday and enjoy a restful morning before welcoming new campers in the afternoon. Our staff to camper ratio is 1 to 5 in our Junior Villages and the Equestrian Village, and 1 to 6 in our Senior Villages. These ratios may differ slightly during activity times and stayover weekends but are always in line with ACA standards. Campers are bunked by age and gender in our Junior, Senior, or Equestrian villages. All villages are equipped with bunk beds, electricity and include bathrooms either in the cabins/lodges or in bathhouses nearby. View our virtual tour to take a look around our camp villages! Yes! Campers may request to bunk with their friends or siblings at the time of registration as long as they are of similar age and participate in the same camp program. We can never guarantee bunk mate requests, but we do promise to do our best to match one friend or sibling request. Yes! 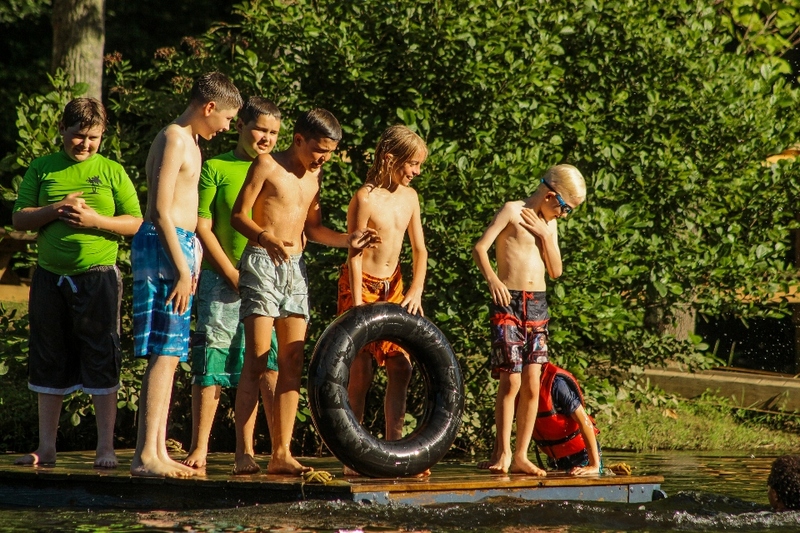 Many campers choose to take the plunge of coming to camp on their own. Camp Friendship staff will always aim to make every camper feel comfortable, no matter their age or if they are first time campers or returners. From the moment your camper arrives, they will be welcomed into our CF Family and are instantly given the opportunity to bond with their cabin mates through get-to-know-you games facilitated by their cabin counselors. Parents are provided with a detailed Packing List in their digital copy of the Parent Handbook, which they will receive once they have registered for camp. Registered parents can view the Parent Handbook by logging into CampInTouch. Can my child bring their cell phone, iPod, tablet or Kindle to camp? Campers are not permitted to bring any personal electronics such as phones, tablets or Kindles to camp. Camp is a unique experience where children can truly connect with others without the use of digital devices. Please give your child the chance to make these connections by leaving technology at home. For campers who fly in from other states or countries we will gladly store your child’s electronic devices and return them at departure. Parents will receive a digital copy of the Parent Handbook, including our technology policies, after registering. Yes, please do! Parents can send eLetters to their campers using our free Camp Stamps service. Parents can request a handwritten reply from their camper, and these will be emailed back to parents. Parents are welcome to send snail mail letters too! Phone calls are not permitted, however if you have any concerns about your camper, you may call their Village Supervisor and/or the Camp Nurse for medical concerns. Campers can handwrite eLetters through our Camp Stamps service, but may not make or receive phone calls. Campers can also send letters and postcards via snail mail. While we can’t guarantee that your child will not be a little homesick for part of their time at camp, we can promise to do our best in helping them adjust to camp life as quickly as possible. After over 50 years of running a successful summer camp, we have developed numerous techniques and strategies to help campers navigate homesickness and settle into their new routine of activities, friendships and fun. We view homesickness as a natural emotion for anyone experiencing separation from home, but we also know that 97% of campers get over this feeling on their first or second day – there’s just too much fun going on to spend time feeling sad! Camp Friendship staff are trained to recognize and respond to homesickness and know that some campers may require more attention than others. Can I see pictures of my child? Yes! Parents can login to CampInTouch to see photos of their camper. Photos are uploaded every evening, and parents can even create guest accounts to share photos with friends and family. Videos are uploaded to CampInTouch and our YouTube Channel at the end of every week. Can I visit my child on the weekends? Parents may visit campers on the weekend with prior arrangement and permission from a Camp Director. All visitors are required to check in at the Camp Office and may not enter Camp unless accompanied by a staff member. Our aim is to serve delicious, yet approachable food in a comfortable space. We want even the pickiest of eaters to feel welcomed at Camp Friendship and we love using local produce, meats and other simple ingredients to do just that. Camp Friendship takes pride in our whole foods approach to the camp diet. Our buffet style meals are kid-friendly in addition to being nutritionally balanced. All meals are nut free and have a vegetarian, vegan and gluten free option available. What if my child gets hungry? Camp tuition includes a daily snack and drink from the Snack Bar. Campers visit the Snack Bar each afternoon and always have access to fresh fruit and cereal in the Dining Hall. What about food allergies and preferences? Camp Friendship goes to great lengths to assist campers with food allergies and ensure that there are always food options available no matter the type of allergy. Our chef operates a nut free kitchen and campers are not allowed to bring any snacks into their cabins to avoid reactions from those with severe food allergies. For campers with specific dietary needs such as gluten free or vegan, please contact a Camp Director to establish a dietary plan for your child. Who will ensure my child stays hydrated? Campers carry water bottles with them everywhere they go and refill them at meal times. Water coolers are available in each activity area should campers run out. Water bottles are on the required packing list and also available for purchase from the Camp Store. Camp also has a “2 pitcher rule” at meals – a table must finish 2 pitchers of water before campers are allowed to drink tea or lemonade. Who will remind my child to apply sunscreen and bug spray? Sunscreen is always available at the lake and the pool and campers are given time to apply before entering the water and reapply after swimming. Campers are constantly reminded to apply bug spray before leaving their cabins for the day, as well as before evening activities and campfire. Who will remind my child to take their medication? Families are required to bring any medications in their original packaging or blister packed from a pharmacy with detailed instructions for administration and a completed administration permission form. Medications are securely stored in our Health Center, where Health Center staff will administer medications as instructed by the physician and parent. If a camper forgets to take their medication, the Health Center staff will alert their counselor or Village Supervisor who will remind them. Who can I speak to regarding my concerns about my child’s health condition? Camp assists families with designing individual plans for children with allergies, asthma and other chronic health conditions. Please contact a Camp Director to discuss whether Camp Friendship is a good fit for your family. Is there a laundry service at camp? Yes! Any camper staying multiple weeks can have their laundry done free of charge. Please ensure you send your camper with a labeled laundry bag. Laundry will be done once a week and campers will receive their clean laundry back the following day. Yes! We offer free airport transportation for any campers flying into or out of an airport to get to camp. Airport pickups and drop-offs can be arranged to/from the Washington DC (Dulles – IAD), Richmond (RIC), or Charlottesville (CHO) airports. Camp will provide linens for any camper flying into camp. Linen sets include a blanket, pillow, sheets and towels. Linens will be refreshed every week for campers staying multiple weeks. Yes! We believe that everyday communication through games and activities is the best way for campers to improve their English. ESL at Camp is a 2-hour activity that provides a unique and fun filled contrast to regular classroom sessions. There is no additional charge for this activity. Camp Friendship aims to offer an immersive experience in our English-speaking community, so campers of the same nationality are generally assigned to different cabins to ensure language immersion. Can we visit camp before we sign up? Of course! We would be happy to show you around. Visits to camp before the summer can often help ease the nerves of first-time campers (and parents!). Contact us to schedule a private tour of camp! Early Registration: Register and pay in full by February 1st to save $100 per week. Multiple Week Discount: Save $100 per week after the 1st week. Sibling Discount: Save $100 per sibling. After March 1: $500 deposit per camper is not refundable. Any additional tuition payments are refundable. After May 15: There are no refunds for cancellations or no-shows. Do campers need any spending money? Campers are not permitted to have cash or valuables at camp, but parents may fund their Camp Store account to purchase Camp Friendship souvenirs, clothing and any forgotten essentials such as battery-operated fans, flashlights, bug spray etc. The recommended allowance for the Camp Store is $30-50 per week. We're always happy to talk about camp!